IPM means different things to different people. Photo © Pinto & Associates, Inc. 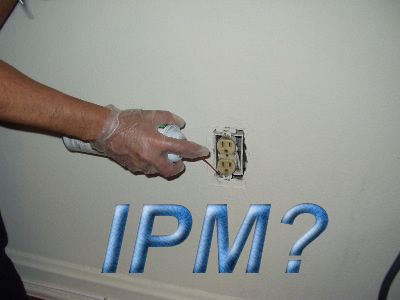 There are as many different views of what IPM is as there are people working with it. To some, IPM is all about controlling pests while never using any pesticides at all. Others say, it's okay to use pesticides, but only the "least toxic" ones, and then only after you exhaust all other possible control tactics. Some define it as combining one or more of the "safer" pesticides, such as baits, with nonchemical tools, such as traps. We believe that most of these definitions miss some part of the the essence of IPM. In scientific jargon, we define IPM as a systematic process for achieving long-term, environmentally sound control of pests through the use of many different tools and management practices. More simply, however, IPM differs from traditional pest control in that it is not based on regular or automatic use of pesticides. In IPM programs, pests are monitored by regular and careful inspections. The inspections also identify conditions contributing to pest problems. The IPM technician decides what actions are necessary, if any, based on the numbers, biology, and habits of the pests involved, and guidelines provided by the IPM program. Priority is given to nonchemical pest management techniques, particularly those that can prevent a recurrence of the problem, such as improving sanitation and pestproofing buildings. Pesticides are used when necessary, but always in ways that minimize potential exposure and risks to people and the environment. Detailed records are kept to track problems, prevent recurrences, and evaluate the results of pest management actions. IPM programs need periodic evaluations to ensure that they are meeting the goal of minimizing pest problems without significant risk to health or the environment. When all of these actions are incorporated into a pest control program, it evolves into IPM, and becomes safer and more effective than traditional pest control. At the same time, IPM is more complex than traditional pest control. It requires a different mindset on the part of technicians, as well as special training and supplies, institutional coordination, and detailed records and reports. We provide consulting services and technical support to establish, evaluate, and oversee IPM programs.